An exciting mix of matte and satin/shimmery eyeshadows and a glowing matte blush is the perfect travel palette from this Ulta Exclusive Tarte Double Duty Beauty Day/Night Eye and Cheek Palette. I've been dying to get my hands on this baby since I saw it on Instagram. I was trying to get it before I left for my California trip but it wouldn't arrive on time so I didn't order it online, but I did manage to pick it up from an Ulta in Anaheim. I am so glad I got this because it is just what I need! 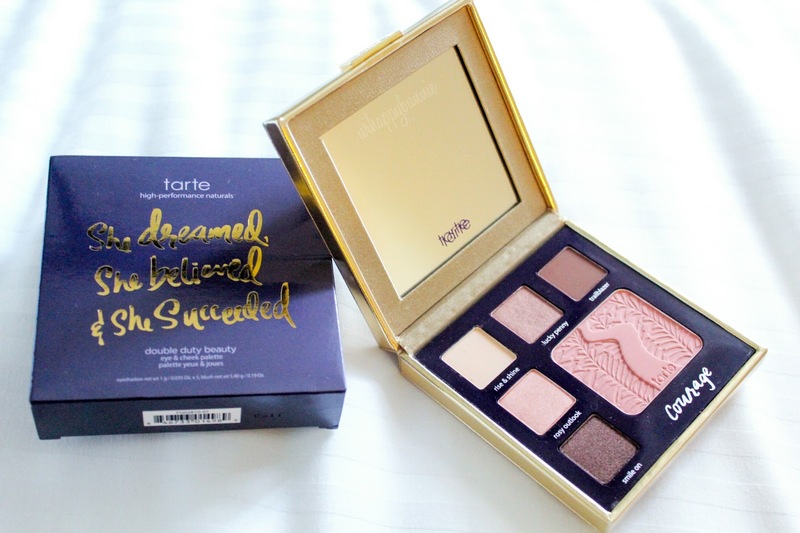 This Tarte Ulta exclusive is released in warm and cool palettes. Classic Courage is the warmer toned palette, whereas Star Power is the more cooler toned palette. I am more drawn towards warmer shades but Star Power also looks amazing that I am heavily debating on getting that one too! 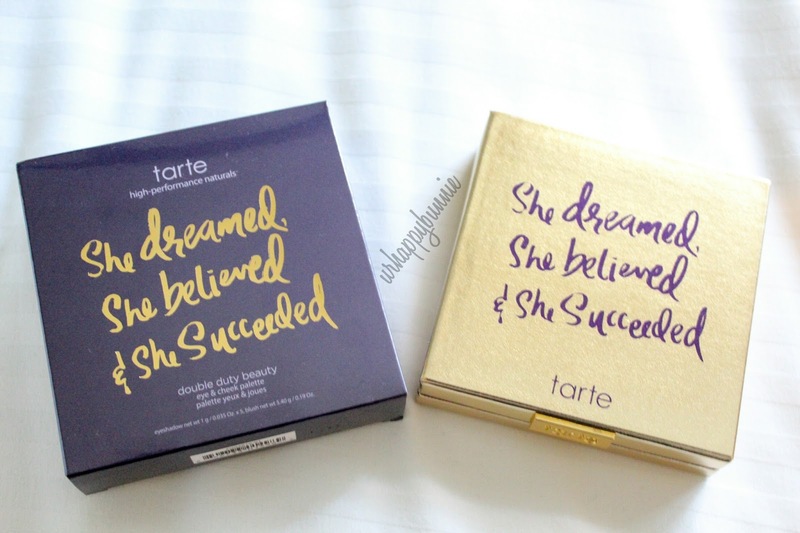 A quote on this gold magnetic lid that says "She dreamed, she believed and she succeeded," gives any girl the inspiration to reach for her dreams and aspirations. The 5 shadows included are the following: Rise & Shine - a matte cream colored shadow for highlighting; Lucky Penny - a light, satin finish copper; Trailblazer - a matte deep brown for contour and blending; Rosy Outlook - a cgampagne/rose gold satin finish eyeshadow; and Smile On - a shimmery deep brown with gold flecks. 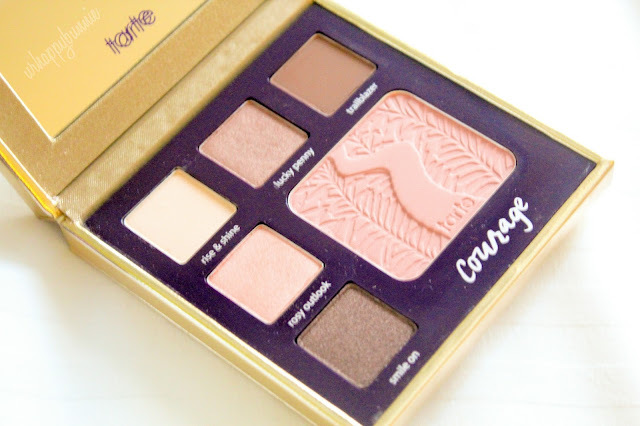 The matte blush in Courage seems to be light on the pan but Tarte blushes are always so deceiving since they are really bright and pigmented once applied on the cheeks. I always find that with any Tarte pressed powder products, especially their eyeshadows and blushes, the color pay off is way better when you're using brushes with application than swatching them with your fingers. Don't get me wrong, they swatch amazingly, soft and pigmented, but wait 'til you get to apply them with brushes, they will blow your mind! 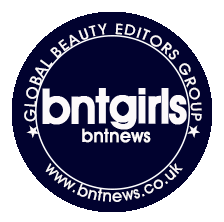 The powders are very smooth and pigmented. They are soft and blendable, very easy to work with. I only have one thing to point out and that's the fall outs. 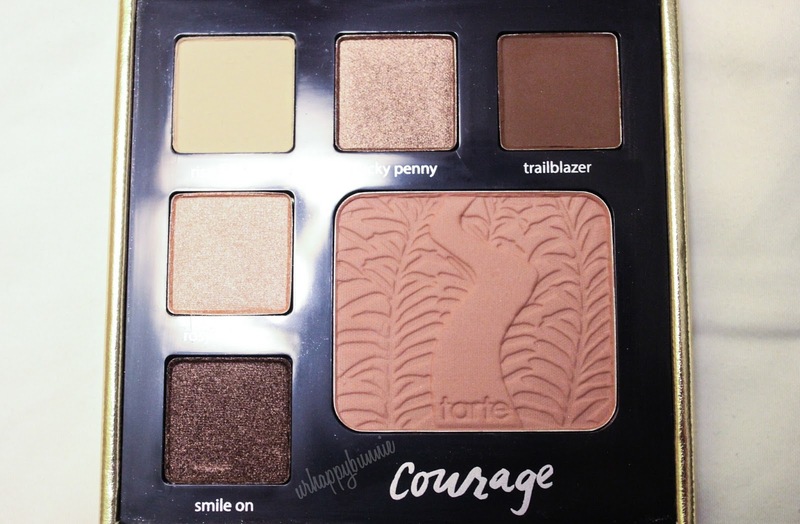 You have to be careful with your darker shadows in this palette, Trailblazer and Smile On, since they do give you fall outs. Tapping off your brush before application or putting your foundation and concealer after your eye makeup is the way to go. I personally don't mind the little bit of fall out since it is pretty easy to clean and dust off and most eyeshadow are that say anyway so I'm used to it but this is just something to keep in mind. I really love the good mix of mattes and satin shimmers in this palette. 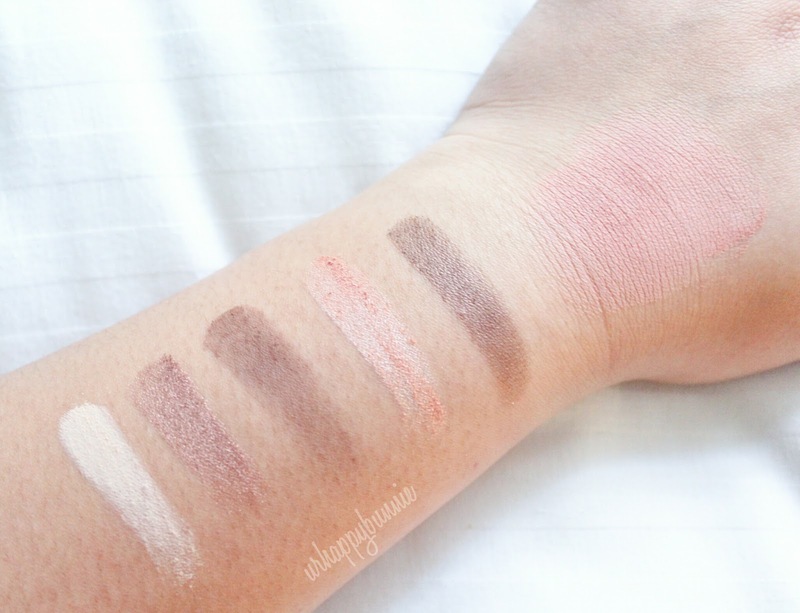 I also love my neutral shades and this can definitely take you from day to night, natural to smokey. This is something I would recommend to everyone especially beginners and working ladies. The shadows are easy to work with and the shades are very work and school appropriate. If you are a beginner, this palette is something that you can try out. Use the lighter shades for a more everyday look and once you are comfortable with makeup, practice building up your skills and incorporate the darker shadows into an upgraded everyday look and then finally move on to a smokey eye. Of course this palette is not as cheap as the palettes in the drugstores but this is a good investment since it is quality makeup. It retails for $28 in Ulta online and in stores. Actually $28 is not a bad price for the amount of quality product that you get. The blush itself is full size so that alone is already more than half of the cost. But yes, go to your nearest Ulta and swatch this baby or go online on Ulta and purchase this!